Daniel Ross Funeral Directors, based in Walmley, Sutton Coldfield are proud to be working alongside Good Hope Hospital in Sutton Coldfield by funding and making available a bereavement guide called “Remember Me Always” which is specifically aimed to help parents support their children when a death has occured within the family. It is estimated that 85% of funerals have a child touch point where the loss may be a grandparent, aunt/uncle, family friend, or more tragically a parent or sibling. The guide is wrote by bereavement child experts but it’s publication funded by Daniel Ross Funeral Directors in Sutton Coldfield who are accredited members of The National Association of Funeral Directors. 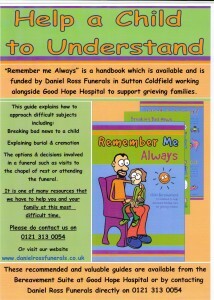 Daniel Ross Funerals in Sutton Coldfield, prove their commitment to the local community by making these most valuable guides accessible at Good Hope Hospital, following a bereavement. The caring family business provide these guides as standard to the families that they serve and is just one of the many resources that they have to help their families at their time of need. Daniel Ross Funerals operate a 24 hour, 7 days a week, support and emergency service on 0121 313 0054 and their funeral home is based in Sutton Coldfield, near to Good Hope hospital. Daniel Ross Funerals of Walmley are extremely proud that the Good Funeral Guide” has choosen to list us as “recommended and best funeral directors” in Sutton Coldfield. Brother and sister Daniel and Sarah pledge to the families that we serve, that we will provide a truly personal service to you and your loved one. The Good Funeral Guide is an independent consumer guide to funerals,it is a book and a website. acquire some background information about death and dying, and find out where to learn more. Above all, the Good Funeral Guide will put you in charge. If you are arranging a funeral, you need advice now. On the website you will find some useful information and many links to other good sources of information. A funeral director in Sutton Coldfield recently went the extra mile plus another 25! Daniel Ross, owner of Daniel Ross Funeral Directors recently attempted and completed his first full 26 mile marathon in Nottingham to raise funds for John Taylor Hospice in Sutton Coldfield. Alongside him, his brother Matthew ran to raise funds for The Alzheimer’s Society. Daniel commented “Both John Taylor Hospice in Sutton Coldfield and The Alzheimer’s Society help so many people and contribute so much to the local community that it was a honour to be able to give a little bit back…. both my brother and I were extremely proud to run in support of their amazing work and I sincerely thank everyone who sponsored us. 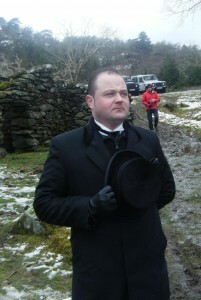 Daniel Ross Funeral Director in Sutton Coldfield raised over £500 pounds for John Taylor Hospice and over £300 pounds for The Alzheimer’ s Society. A funeral director in Sutton Coldfield is going the extra mile to support John Taylor Hospice in Erdington by entering into his first full marathon! Daniel Ross Wolsey of Daniel Ross Funerals, in Sutton Coldfield, enters The BBC Robin Hood Marathon on Sunday 26th September 2010 and will attempt a full 26 miles. The independent family funeral director, based in Walmley, Sutton Coldfield hopes the local community will sponsor his run and raise funds to support John Taylor Hospice in Erdington. Any persons kindly wishing to sponsor Daniel and John Taylor Hospice may do so via the funeral home, Daniel Ross Funerals, Grace Mary House Funeral Home, Eachelhurst Road, Walmley, Sutton Coldfield. Telephone 0121 313 0054. Walmley residents can celebrate the British summertime in traditional style this weekend, with cream teas and English strawberries at the Annual Garden Party at St John’s Church. “It’s summertime, it’s Wimbledon Finals Weekend and there’s nothing more British than ‘Strawberries and Cream’ ” said Daniel Ross from Daniel Ross Funerals who are supplying the delicious treats free of charge. The Walmley based funeral directors on the Eachelhurst Road, Walmley, Sutton Coldfield will also be donating commemorative items to help raise money for St John’s Church. Cash from the sale of the engraved memorials will go towards a holiday for members of the Bereavement and Support Groups at the church. The memorials are small items that have messages on them such as “In loving memory of Grandma” and can be placed on gravesides as a lasting tribute or in the garden at home in remembrance of a loved one. “There’s great importance to us, as a local business, to support our local community and we sincerely hope that monies raised by the commemorative items will help to support our local families in need” Daniel who owns the Independent family firm. St John’s Church Centre Manager, Mr Gordon Ward is hoping many people will attend and support the community: “With the wonderful weather we’ve been having we’re hoping the Garden Party will be a huge success and we’re delighted to be working with Daniel Ross Funerals. The garden party takes place on Saturday July 3rd at St John’s Church between 11am and 3pm and all are welcome. More news on Daniel Ross Funerals within the local community can be found on their website www.danielrossfunerals.co.uk. 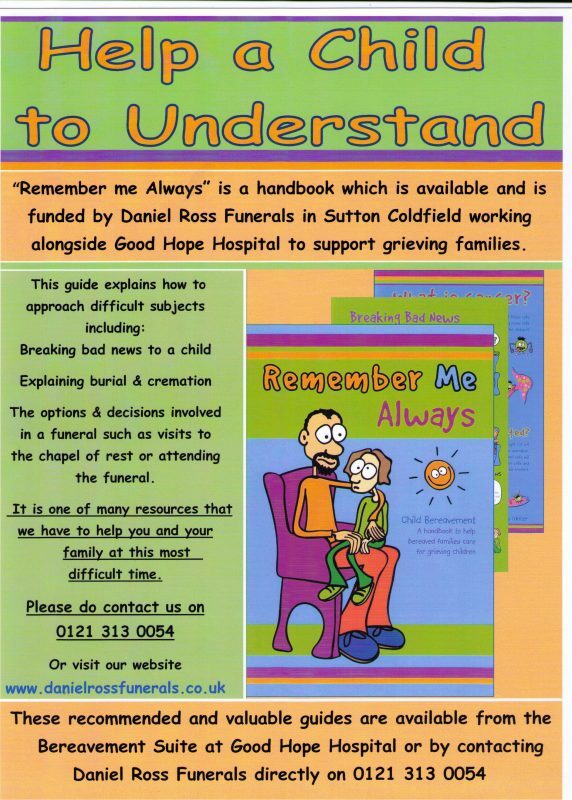 Daniel Ross Funerals of Walmley, Sutton Coldfield has taken its recently-launched Child Bereavement Support Campaign to the next level, by funding and making available new handbooks to support and guide people working in schools and other educational environments. The user-friendly school handbook follows hot on the heels of a successful version for parents and carers, which was released in February (2010) by the Eachelhurst Road business. Local schools have been told about the handbooks and complimentary copies have been made available. Posters have also been designed. Daniel Ross Funerals co-owner Sarah Wolsey said the latest publication covers a wide range of issues. It also contains a wealth of advice from child bereavement experts. Posters were supplied for use at each school’s own discretion, in case staff decided they wanted to further publicise the handbooks for parents and carers. “I have always personally believed there is a need for extra help and support for those caring for children following bereavement,” said Sarah. She said the response to the campaign had been “totally overwhelming”, firstly from parents and now from teachers and teaching assistants. “It is so positive and encouraging for parents to know that the care and support given at home is being continued and followed through whilst the child is at school. It is wonderful to have everyone pulling in the same direction,” added Sarah. Copies of both guides – the teachers’ resource or parents’ handbook – along with the poster, are available from the business. Simply visit the website: www.danielrossfunerals.co.uk or call its 24-hour telephone helpline on: 0121 313 0054. Snow distance too far! A personalised funeral. West Midlands Funeral Directors, Daniel Ross Funerals, has proven they will go to any lengths – or distance – to provide a personalised funeral service to their clients. The family firm recently arranged a burial on private land, and travelled over 200 miles in heavy snowfall to deliver a truly personal service to the bereaved family. Daniel Ross Funerals, based in Walmley, Sutton Coldfield, has staked its reputation on its ability to deliver tailored funeral services, and the arrangements for this particular funeral certainly put that reputation to the test. The firm’s owner, Daniel Wolsey, explains: “The family came to us with some very specific requests – they wanted to provide the coffin and the transport themselves, and the burial was to be on the family’s own land, 200 miles from our funeral home. It was a privilege for Daniel Ross Funerals to be selected to assist the family with the arrangements for this particular personalised funeral, and the heavy snowfall made it a special and memorable tribute. Daniel Ross Funerals believe it is possible to be very involved and make a funeral more personalised by playing a small part in the ceremony such as pall bearing the coffin or writing the eulogy, whether it is a traditional, a religious or a green funeral. There was a lot of media coverage surrounding the opening of our brand new funeral home in Walmley, Sutton Coldfield. Grace Mary House was opened on 12th November 2009 by the Right Worshipful the Lord Mayor of Birmingham, Councillor Michael Wilkes & the Lady Mayoress of Birmingham, Mrs Vivienne Wilkes. There were many special guests in attendance including the Vice President of the British Institute of Funeral Directors and local clergy. A symbolic dove release marked the official opening, and then the chapels of rest were dedicated and blessed. Based half a mile outside Walmley village centre, the funeral home has a large frontage and enjoys a prime corner position. Major refurbishment involved taking the building back to a shell and then reconfiguring the space to create a large reception, arranging room, general office, preparation area and mortuary. The premises also have two chapels, the larger of which is capable of being used for a small funeral service accommodating up to 20 people. The room can also be partitioned to create two smaller viewing chapels.